AC MILAN MANAGER Gennaro Gattuso revealed he is tense even when playing football with his son as he celebrated his first win in charge of the Serie A giants. Giacomo Bonaventura scored either side of Simone Verdi’s 23rd-minute goal to guide Milan past Bologna 2-1 in Serie A on Sunday. 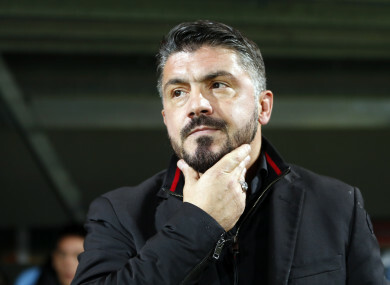 It marked a first win at the helm for club great Gattuso, who replaced Vincenzo Montella late last month. The former defensive midfielder said there was still a lot of work to do for his seventh-placed team as he explained the tension he felt on the bench. “I’m always tense, even when I play football with my son, but certainly on this bench it’s even more exciting,” Gattuso told Mediaset Premium. He added: “We still have to improve, especially on the defensive aspect, because Bologna have put us in trouble on more than one occasion. “But I have to thank the guys for the victory, for the mentality and the sacrifice they made on the field. Bonaventura’s 76th-minute goal was decisive for Milan, who ended a three-game winless run in the league. Gattuso hailed the Italy international, labelling the 28-year-old one of the best midfielders in Serie A. “He can play everywhere. He has great quality, he knows how to score,” he said. Email “Gattuso: 'I'm always tense - even when I play football with my son'”. Feedback on “Gattuso: 'I'm always tense - even when I play football with my son'”.